Emma Schneider, aged 22 months, arrived at Schneider Children’s ER with a fever. While being treated, her lungs collapsed. 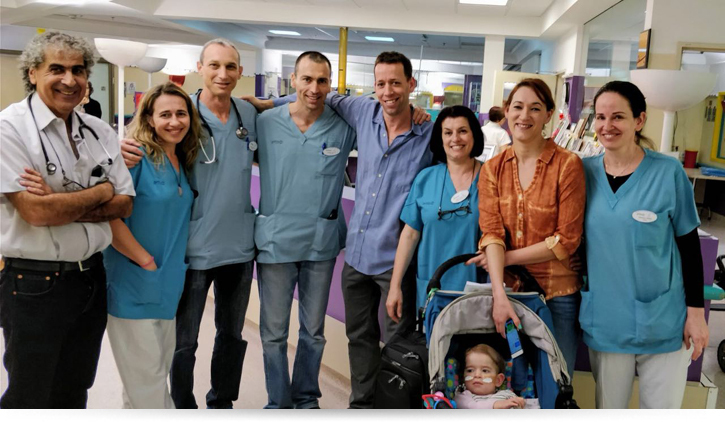 She was transferred in critical condition to the Pediatric Intensive Care Unit and then the Cardiac Intensive Care Unit headed by Prof. Ovdi Dagan, where she was connected to an ECMO machine for 68 days. ECMO -Extracorporeal Membrane Oxygenation - replaces the activity of the heart and lungs. The prolonged connection to ECMO allowed Emma’s lungs to successfully recover despite the inherent dangers and complications of being on support for such a lengthy period. She was finally discharged after 103 days of hospitalization.